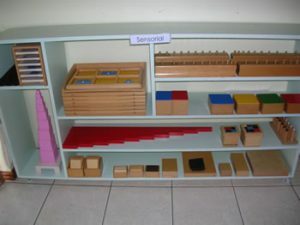 Montessori is an approach to early education that focuses on the immense capacity of children to absorb information when given the freedom and independence to learn at their own pace and takes into account how children’s thought processes differ from those of adults. It is now over 100 years since the first Montessori school was established in a slum area of Rome in 1907, and yet we find that the approach fulfills the needs of children in the 21st Century. • Children learn through exploration through their senses and through movement. • They need freedom within a structured environment in order to do this. • They need the opportunity to make constructive choices of activities and to learn through repeated experiences. • Learning skills for daily living develop independence and self-esteem. • Self-discipline is developed through the framework of acceptable ground rules for behaviour. • Close contact with reality and nature is encouraged to allow the child to understand his/her place in the world. • Diversity is embraced and explored. 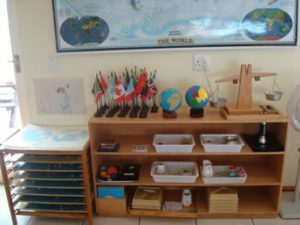 When allied to an availability of specially developed materials in a favourable environment, and under the close observation and guidance of a Montessori-trained directress/teacher, this leads to an enormously powerful, confidence-building approach to learning. 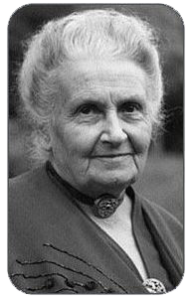 The Montessori approach has proved so successful that it has been adopted all over the world and continues to influence ‘mainstream’ educationalists thinking everywhere. 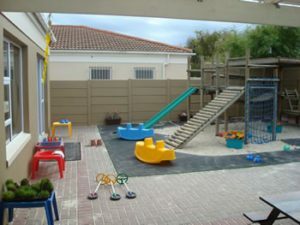 Today they are over 300 Montessori pre-schools around South Africa and many thousands more around the globe. These are the very first activities children take part in, in a Montessori classroom. They develop their ability to look after themselves and their surroundings. They can practice dressing skills on specially made frames, which allow them to try zips, buttons, bows and buckles. They use little jugs filled with beans or rice and then water to practice pouring; they spoon, scoop, or use droppers, tweezers and even chopsticks to transfer from one bowl to another. 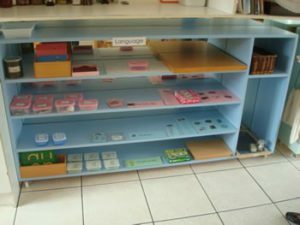 Other activities use scaled down versions of real equipment: brushes and brooms, wash-up bowls and cloths, show cleaning and polishing kits, even a tiny safe iron and ironing board. There are also varied opportunities for pairing socks, folding and sorting clothes, setting a table, plaiting and sewing - even packing a tiny suitcase. Children gain confidence and competence through practical life activities. Their added purpose is that children who work on real tasks which involve the hand and the mind together develop a great capacity to concentrate, which is the best possible preparation for the intellectual work to come. One of the first pieces of sensorial apparatus children use when they come into the nursery is a set of solid geometric forms, which they explore with their hands, matching identical ones and sorting into sets according to their geometric properties. At first they are presented in baskets, each basket having one type of solid: semi-regular solids, curved surface solids and so on. As they get older, children become fascinated with words and are given the names: pyramid, dodecahedron, and ellipsoid. Another piece of material uses flat geometric shapes - circle, square, triangle, rectangle, rhombus, which are fitted into spaces on a tray, rather like a jigsaw puzzle. On the Sensorial shelves there will be specially designed materials to encourage development of the senses, such as a tower of pink blocks; sets of cylinders gradiated in size; cylinders with knobs which have to be fitted into the right holes in a block; rough and smooth tablets in boxes; smelling bottles; fabrics to sort by touch; puzzle blocks called the binomial and trinomial cubes which are interesting in themselves but later turn out to be a physical illustration of mathematical formulae. 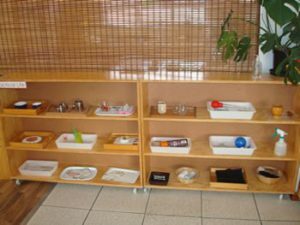 Each of these is used to stimulate and refine one of the ten sensory areas and each will be presented to the child to be used in an exact way to aid his development. The sensorial materials also prepare the child for reading and writing. Some materials, like the cylinders of the geometric insets which are held by their little knobs between finger and thumb, prepare the muscles of the hand for writing, others prepare the ear for hearing fine differences in sound (to prepare for, among other things, distinguishing between letter sounds) by listening both to silence and to sounds which are presented as 'noise' with the sound boxes and as musical notes with the bells. Sorting tablets according to subtle difference in shade and colour sharpens the child's perception of slight difference, another prerequisite for recognising letter and number shapes. If each step is taught by itself, one step at a time, the child will gradually integrate the different skills and will emerge, often seemingly effortlessly, as a competent reader and writer. Children begin with globes and then study maps using jigsaws. They can trace and colour the shapes of each continent as well as placing them in the right place in the puzzle. They go on to name and put the shapes onto blank maps of the world and to recognise flags. Looking at countries individually they will use picture cards of mothers and babies, families and their daily lives and handle and examine artefacts from other cultures - a Japanese fan, chopsticks, a sari or an African drum. Many schools have cultural boxes, one for each country, filled with all the exotica teachers can find to bring new places alive. The land forms teach geographical features. They are a set of models showing islands, bays, capes, peninsulas and isthmuses and lakes for children to fill with water and perhaps float a little boat or put an animal on the land. Many classrooms now have wonderful scale models of the planets and the solar system and a take-apart model of the earth, which reveals its layers and core. Science materials give opportunities to experiment with magnets, light, air, and even build simple circuit boards to light a tiny bulb. In many areas of the cultural curriculum children use classification cards for naming, matching or identifying anything and everything from leaf shapes to different kinds of stone to different stages of a tadpole's metamorphosis into a frog. The breadth of children's knowledge of their world when they leave Montessori school can be quite astounding. Children aren't born with an innate knowledge of why we shake hands, or kiss, or rub noses depending on our culture and in the Montessori classroom they learn appropriate greetings. As they become aware of other cultures they are encouraged to celebrate differences and value them equally. During circle time children are shown how to move quietly and carefully around the classroom, push in chairs, wait patiently before politely gaining someone's attention and are reminded how important it is to allow others to work undisturbed. These ground rules in the classroom give every child total security. Children also learn to notice if somebody needs help and that nobody is too small to be useful. Writing often comes before reading in a Montessori classroom with children building up their first words phonetically using cardboard letters. The reading program progresses through three dog. She takes it out, says the word, listens to the sounds in it and then seeks out the letters, which make those sounds to build the word. Writing skills are learned by colouring intricate shapes drawn with insets, and sandpaper letters are experienced by touch as well as by sight and sound. A wide range of story and reference picture books are always available in the classroom. Levels: pink, blue and green - reading materials are colour coded for each level. Inside a small pink box a child finds a tiny toy. 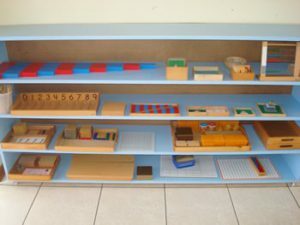 Children gain a physical impression of size and quantity long before they begin to manipulate numbers by handling number rods, counting out beads, counting spindles into boxes and arranging coloured counters in patterns - odd and even numbers. Numbers are built up using glass or wooden beads and their sandpaper symbols traced with the fingers. Pie-shaped frames with inset pieces give the concrete grounding in fractions, which the child can refer back to for years to come. Painting and drawing activities are freely available in the classrooms. The directress includes performing, dancing and singing activities during work time.